Buy online Ixpe Foam with 0.4 mm PE Film 100 sq. ft. 43.3 in. x 2 ft. 3.8 in. x 2.5 mm Premium 2-in-1 Underlayment HLIXPE25 and leave review or share with Your friends. 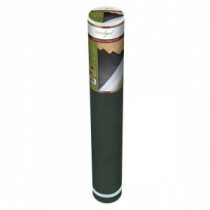 Premium 2-in-1 Underlayment plus Sound reduction is a 2.5 mm high density cross-linked polyethylene foam underlayment. The 3 in. overlapping film and adhesive strip allows for ease of installation and moisture protection at the seams. This lightweight underlayment covers up to 100 sq. ft.
100 sq. ft. roll 2.5 mm x 43.3 in. x 27.8 in.